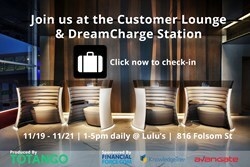 Totango announces two partnerships and their Dreamforce presence: The Customer Lounge and DreamCharge Station. Totango, the leader in customer engagement management, just wrapped up its most impressive quarter ever. The company closed 20 new customers including Optimizely, OpenDNS, Swipely, SpredFast, Avangate, CentralDesktop and Kapost, making it the fastest growing company in its market. In addition to tremendous customer momentum, Totango made two major partner announcements in October: an OEM relationship with Jive and the launch of the Totango Insights app for Zendesk. In partnering with Zendesk, the new Totango Insights app gives support agents the unique capability to instantly access — in real-time, right within Zendesk — valuable insights on the health and engagement of the customers they are assisting. Agents can quickly identify power users from beginners, understand if an account is at risk or approaching renewal, and see a summary of the user's most recent activities. “As a trusted partner, Totango has proven its ability to provide valuable insights that can empower support agents and help companies turn support incidents into great customer experiences,” said Conan Reidy, vice president of business development at Zendesk in the official release. With Dreamforce just around the corner, Totango is producing the Customer Lounge and Dreamcharge Station sponsored by pro-customer companies such as FinancialForce, KnowledgeTree, and Avangate, to deliver a truly customer-focused experience. The Customer Lounge and Dreamcharge Station will run Tuesday, November 19, through Thursday, November 21, from 1-5pm PT at Lulu’s Restaurant. For more information check out http://www.totango.com/dreamforce-customer-lounge. Totango is the leader in customer engagement and user insights for cloud apps. The company helps SaaS vendors and online subscription services take a data-driven approach to reducing churn and driving customer success, product adoption, and trial conversion. Totango monitors customer behavior and usage in applications—along with critical relationship data from CRM, billing, and other systems—to generate insights on customer health and engagement. The company’s platform combines big data analytics with powerful segmentation and predictive tools to guide vendors in taking the right actions with each customer to create an active, engaged user base.